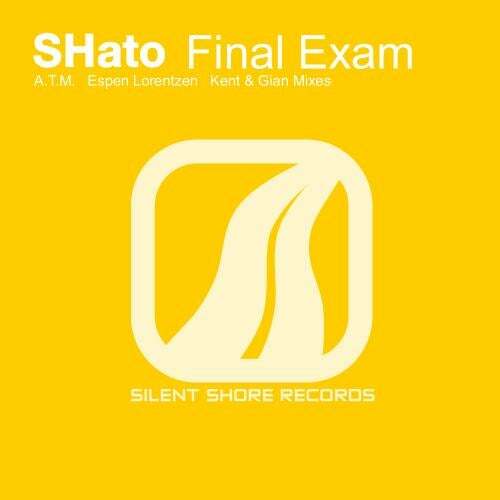 SHato is here again with his newest original tune Final Exam. He really proves he has his own prestigious feeling of the melodies and style of his own. Final Exam is one melodically filled piece of art. Usual strong kick and bass accompanied with chopped-pitched vocals and stunning melody drives you to heaven. If you want to make people move in the club than this is your choice. Final Exam comes with remixes by A.T.M., Kent & Gian and our newest Espen Lorentzen. A.T.M. from Ukraine know what is energy and they show it in their remix. Speed, power, and amazing breakdown that is the simple way how to describe this powerful remix. Kent & Gian, known from previous mixes for their specific style combining Tech Trance with Uplifting and Progressive. Again you can look forward for strong bass variations and clubby feeling. Espen Lorentzen is one of our freshmen. His progressive remix suits the best to his style: Progressive. Fabulous breakdown accompanied with piano melody and after unleashing to the full that the way the tune should go. To make people raise their hands as much as they can. We hope you will enjoy this release. Thanks for your support!